This summer marks the 70th anniversary of the Summer of 1944, the Summer of D Day, and the beginning of the end of World War Two. The world just celebrated the D Day anniversary with much deserved pomp and gratitude, honoring the sacrifice of the survivors, and the memories of the fallen. 1944 holds other anniversaries as well, ones much less worthy of celebration but just as important to commemorate. 1944 was also the worst summer of the Holocaust, with the gas chambers at Auschwitz working almost around the clock to eliminate trainloads of Hungarian Jews. By the spring of 1944, the Germans had been in full retreat in the East for almost a year, and had lost Italy and North Africa. Hungary, which up until this point had been an Axis ally, was attempting to make a separate peace with the Allies. When word got to Berlin about this betrayal, Germany invaded Hungary in March 1944 and instituted a friendly government. The Nazis also sent Adolf Eichmann to Budapest to begin deportation of the Hungary’s Jewish and Roma populations. Until the German invasion, the Jews in Hungary had been protected from deportation and although they were subject to significant restrictions, the Jewish community remained largely intact in Hungary. This changed dramatically with the German invasion. …97% of the Jews deported that summer went to Auschwitz, and 90% of those were gassed immediately upon their arrival. Within weeks of the invasion trains began deporting Jews from Hungary, almost all of the trains bound for Auschwitz-Birkenau. 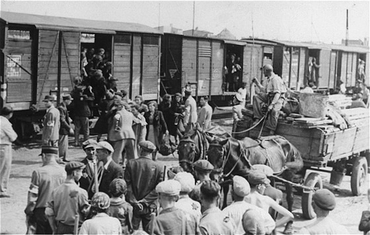 According to the Hungarian Holocaust memorial website, between mid May and mid July more than 437,000 Jews were deported, in 4 trains loads per day, each train convoy consisting of 45 wagons with 70 people crammed into each wagon (1) 97% of the Jews deported that summer went to Auschwitz, and 90% of those were gassed immediately upon their arrival. The gas chambers at Auschwitz were active virtually around the clock that summer, so much so that by the time the camp was liberated, one out of every three Jews who died at Auschwitz were Hungarian. There were so many bodies that summer that the crematoria at Auschwitz, which were designed to dispose of 130,000 bodies a month, were taxed beyond their limits and the bodies were actually burned in open fields (2). The Nazis actually diverted trains from the war in the east to Hungary to deport as many Jews as they could as quickly as possible. This is a crucial point, and it is worth reiterating: the Nazis diverted trains from bringing supplies to the war in the East (and wounded back to Germany), from a war they were already losing. They hampered their ability to continue to fight a war, losing German lives in the process, to be able to deport and kill more Jews. It is important to note that the Germans did not divert all or even most of their trains away from the war effort, the highest estimates are 5% of their train capacity; but 5% is important when you have men dying at the front for lack of supplies. That 5% became even more important after June 6, 1944, when Operation Overlord, or D Day, was launched in the west. Just 2 weeks after D Day, the Soviets launched Operation Bagration, the largest offensive of the war. Bagration was wildly successful, hurling the Nazis back toward Poland almost immediately. Even after this latest set back, the Nazis continued the massive deportation of Hungarian Jews to Auschwitz. …the Nazis prioritized the Final Solution over the needs of prosecuting the war. Planning and executing a war is very much about allocating resources, and how the military command structure prioritizes its resources can determine the success or failure of the army in the field. It is clear from this example that the Nazis prioritized the Final Solution over the needs of prosecuting the war. It has been suggested that the Final Solution was indistinguishable from the war, that they were one and the same, and while the Nazis were winning the war, that was true. However, once the tide started to ebb and then rush the other way, the Final Solution became an impediment to the success of the war effort, and yet not only was the Final Solution not curtailed in the face of the military situation in the summer of 1944, it was actually accelerated.